Constructed of all types of leathers, leather luggage with reversible (near invisible) zippers, and finished with antiqued silver hardware, this updated classic will keep you traveling in style. Wide-mouth zippered opening makes packing a breeze and the unstructured design gives you enough room for a weekend getaway or is collapsible when space is tight. 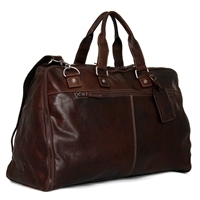 The Siamod Amore Leather Duffel Bag Cognac, this is a great weekender or gym bag. Everyone needs a versatile, go-to travel bag at their disposal, one that’s ready to go everywhere. Merging the best of a duffle bag and a garment bag, Jack Georges created the ideal travel companion for every trip on your calendar. Even the simplest adventures can be grand with the Safari Bag. 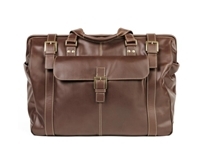 Baggage Buy has the leather luggage for you. We are here to help.